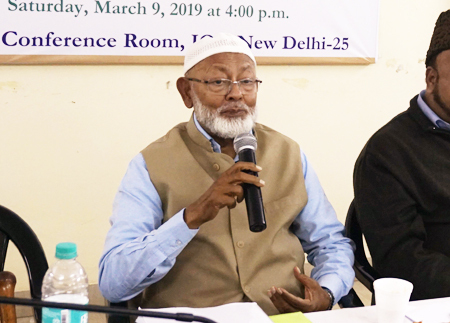 A lecture based on the review of the book The Cultural Atlas of Islam by Prof. Ismail Raji al-Faruqi and Lois Lamya al-Faruqi, was organised by the Institute of Objective Studies book (IOS) at its conference hall on March 9, 2019. 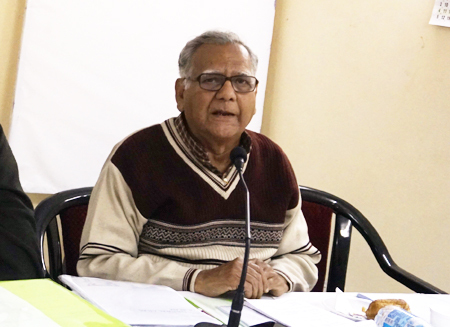 Prof. Ishtiaque Danish, ex-head of the department of Islamic Studies, Jamia Hamdard and finance secretary, IOS, delivered the lecture on four chapters of the book. These included: the Essence of Islamic Civilisation, The Qur’an, The Sunnah, and The Science of the Qur’an and the Science of Hadith. In his lecture, Prof. Danish said that Prof. Ismail Raji al-Faruqi studied Islam and social sciences in a Western milieu. Thus he skipped the contribution of Muslims to natural sciences, social sciences and the humanities. He said that the Cultural Atlas of Islam was a pioneering work of Prof. Faruqi and Lamya al-Faruqi, adding that culture and civilisation were largely shaped and developed by religious people. This was true about Islam as well as other religions. That was the reason why the authors, Ismail and Lamya had first discussed the most fundamental sources of Islam– the Qur’an and the Sunnah. Prof. Danish held that revelation and prophethood had a long tradition and history which the al-Faruqis thoroughly discussed. The Qur’an is the culmination of all previous revelations. The holy Qur’an was revealed to Prophet Muhammad (PBUH) by Allah’s Archangel Gabriel (Jibrael). The Qur’an is the word of Allah which confirms previous revelations in their original, pristine form. It is the most beautiful composition, which is beyond human capacity and, therefore, is divine. He said the message of the Qur’an is belief in One God, belief in the institution of prophecy or prophethood and belief in the Day of Judgment. He noted that the Sunnah implied putting the teachings of the Qur’an in action: how to say a prayer and how to perform other pious deeds. The Sunnah is important, for the Qur’an, the Word of Allah, has ordained Muslims to follow and obey the Prophet Muhammad (PBUH). The Prophet was a caller, daa’i, and slave abd, or servant of Allah. Prophet Muhammad (PBUH) was a family man and a leader. Prof. Danish observed that the science of the Qur’an referred to its proper recitation and the context of revelation, asbaab al nuzul. It also included historical exegesis, tafseer and its kinds, extraction of law, juristic categorisation, the permitted and the prohibited. He explained that the Sunnah dealt with Ilm-e-Hadith like riwayah, dirayah, Asma al-Rijaal, jirah and taadil. Ilm-e-Hadith was very important because we could not verify the sayings and practices of Prophet Muhammad (PBUH) without it, he remarked. Raji’s book had two aspects - the art of culture and faith. While no generalisation was complete in itself, the Western scholars adopted territorial methodology to study of Islamic texts. According to them, the study of Islamic texts in countries, like Iraq, Iran, Africa, Indonesia, etc. could be understood in terms of territorial methodology. But, he said that Muslims adopted chronological methodology to treat the subject. Both the methods had some exceptions. Some Christian scholars invented a new methodology in the seventies and eighties which was different from both the methodologies discussed above and pointed out the demerits in them. The third method was called phenomenal methodology. This method seeks to express no opinion of its own and rely only on the available texts. This simply meant to place facts before readers. This method could be understood in the context of rejection of Christianity by some, only to be accepted later. Prof. al-Faruqi studied culture because he thought that the data of the past could not be generated or recreated, but could only be interpreted. He took data from history. Referring to the memorisation of the Qur’an, he said that Prophet Muhammad (PBUH) did not himself memorise verses revealed to him, but it was his companions (Sahaba) who memorised them. It was said that some 30,000 companions of the Prophet (PBUH) memorised the verses. He noted that the seven qirat (way of recitation of the Qur’an) were approved. The pronunciation of the qaris (reciters) differed from one country to the other due to the influence of local dialects. Prof. Danish elucidated that chapter 6 of The Cultural Atlas of Islam dealt with the Sunnah, which was defined by al-Faruqis. The Sunnah had been defined by them as including everything of the Prophet (PBUH)–from head to toe. The Sunnah was part of everything related to the Prophet (PBUH)–His deeds and sayings. Regarding dawah, he said that it differed from place to place. The Prophet (PBUH) was a family man, had wives and children. His compassion was unparalleled and the people’s faith in him as the hope for orphans was infallible. It was usual for him to help every needy person who came to him. He never sent anybody empty-handed. Prof. Danish said that the Prophet’s (PBUH) noble qualities were authenticated by his first wife Hazrat Khadijia (RA) who, being his wife, would give an authentic version. Commenting on the third chapter of the book, he said that a new phenomenon emerged after the Prophets’ (PBUH) migration from Makkah to Madina. And this phenomenon was cultural in its nature. He opined that the Surahs revealed to him in Makkah and Madina were important to understand the Qur’an. With regard to asbab-i-nuzool (circumstances of revelation of verses of the Qur’an), he said that some verses had contextual and situational reason. He observed that the Qur’an is a unique Book of Allah the language of which had never been written nor heard before. The Prophet’s (PBUH) entire life was imbued with the Sunnah. He said that ilm-e-riwayat was the first knowledge of the Hadith. And the discourse on Hadith was called ilm-e-riwayat. While referring to the Hadith, the source of it must be ascertained. Sanctity of the Hadith lay in its reliability. The al-Faruqis also made reference to ilm-e-hadith. He said that Islamic fiqh (Islamic jurisprudence) existed first and Muhaddiseen (commentators of the Hadith) came later. Similarly, the Qur’an was followed by the Hadith and both of them are the fountainhead of the faith, he concluded. 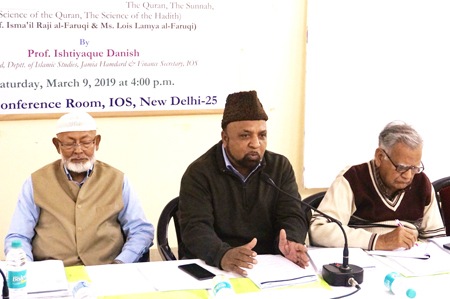 The chairman, IOS, Dr Mohammad Manzoor Alam, observed that Prof. Ismail Raji al-Faruqi was not only educated in the West but also studied at Jamia al-Azhar, Cairo. He said that the relevance of Islam was not confined to a particular time frame. It would be relevant for as long as the world existed. Professor a-Faruqi’s book on Tawheed referred to the evils of today. He announced that the concerned chapters of the book would be brought out in a booklet form. Underlining the importance of the book, he said that it was still relevant and asked the younger generation entering the portals of knowledge to read al-Faruqi’s books. Defining civilisation and culture, he said that culture was the reflection of the past. What came into conflict with Tawheed, would be rejected, he added. In his presidential remarks, the secretary general of the IOS, Prof. ZM Khan, said that Prof. Danish touched upon all aspects of the chapters he discussed. It was Prof. al-Faruqi who told us how to follow deen in this age. He felt saddened that today religion had become personalised. That was the reason why one’s character and actions were very important in his life. While in Africa, there was a tribal society, in West there was no institution of family, no tribe. An individual was the unit there. He said that in the US domestic violence was on the rise and women were thrashed more than anywhere in the world. Prof. al-Faruqi in his works focused on man, material and time. He stressed that his books needed to be studied. Earlier, the lecture began with the recitation of a Quranic verse by Hafiz Wasim Akram Nadwi. 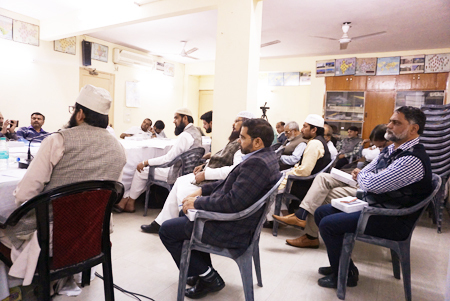 Shah Ajmal Farooq Nadwi, in-charge of the Urdu section of the IOS, introduced the subject. He also conducted the proceedings and extended a vote of thanks. 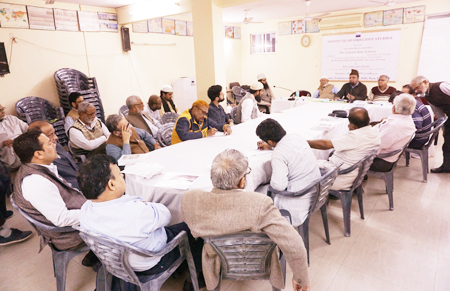 The lecture was attended by Islamic scholars, ulema, university teachers’, researchers and prominent citizens of the town, including Prof. Hasina Hashia, asstt. Secretary general, IOS.